NiFi is a fantastic tool for moving data from one system to another, and in combination with Kylo self service front end it makes it easy to move data. 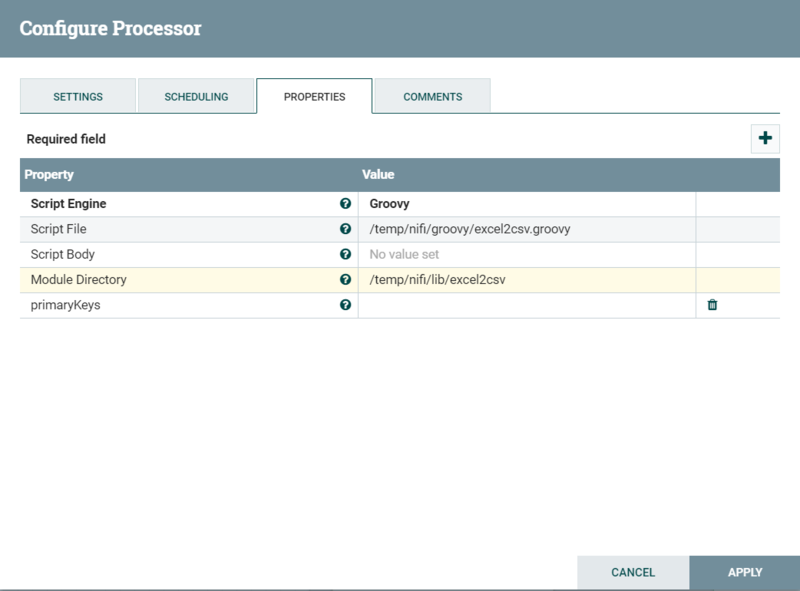 Process data in NiFi is easy as it comes bundled with a lot of processors and the ability to extend with your own processors written in java or use a generic processor for writing processors in groovy for example. I have developed a small groovy code to read an excel document and convert it to csv to be possible to ingest into Hive table. You can insert the groovy code directly into the NiFi ExecuteScript processor or put the content into a file in your filesystem like I did on my Mac notebook. table_feedFormat="ROW FORMAT SERDE 'org.apache.hadoop.hive.serde2.OpenCSVSerde' WITH SERDEPROPERTIES ( 'separatorChar' = ',' ,'escapeChar' = '\\\\' ,'quoteChar' = '\\\'') STORED AS TEXTFILE"